Cheeky Donkey: 9Y4M 7Y7M また会えました　Saw Brum again! 9Y4M 7Y7M また会えました　Saw Brum again! We've been in Penang for nearly 6 years. 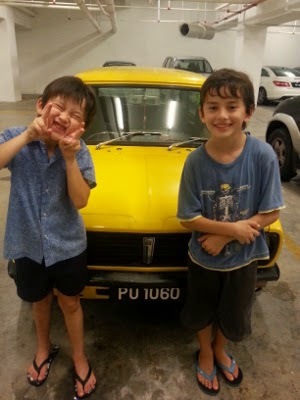 When we lived at Bellisa court, we often saw this car. 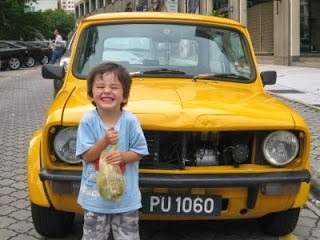 It's similar to the car, Brum, from cbeebies TV programme and Arata liked it. We saw the same car a few months ago around Gurney. And when we happened to see it near Marina Bay, when the car was about to leave, I was nearly knocked the window to talk to the drive. Well, we saw it again at Paragon. This time the car was in the car park, and boys were happy to see it.